My friends, it is stunning how much football information is within this site from years of work by so many writers, analysts and coaches. I am creating this article for the sole purpose of simply creating a link for other places on the site to help the readers and coaches to find their topic of interest. To go directly to the new Analysis Library by FishDuck.com, do click here for the Analysis Library. This incredible Analysis Library has over 330 different analysis articles that are categorized and organized to find your subject quickly. Some articles are placed in several different categories as a particular analysis may cover more than one particular topic. 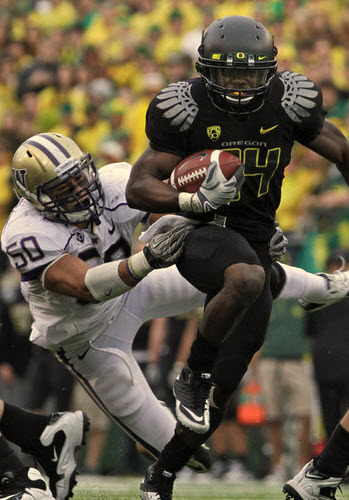 Kenjon Barner powers thru Washington. I was contacted by a NFL website for a half-hour interview for a podcast about Coach Mark Helfrich, thus my goal was to have it up in the next week–and did. My friends, part of my gift to fans and coaches everywhere is this Analysis Library (part of the bigger Oregon Football Repository created as well) and the modest hits/visits will help pay the costs of the site since current articles are only two to three a week is all. What is in the Analysis Library? Wow….it encompasses so much Oregon football that I can barely believe it, and there is nothing like it out there for free. There is a designated page for all the World Famous FishDuck Oregon Spread Offense Instructional Videos that have been viewed over 1.7 million times and counting. We have a complete section on the Oregon Spread Offense and separated into two sections; the Chip Kelly, Mark Helfrich and Scott Frost Spread Offense, with another as the Mario Cristobal, Marcus Arroyo and Willie Taggart Spread Offense. Within these sections are categories such as the Playbook, Passing Attack, Zone Reading, No-Huddle and Game Planning as examples. 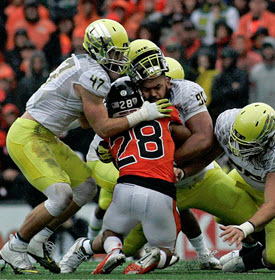 Whoa–this not only about offense my friends as all the articles about the Nick Aliotti and Jim Leavitt defense will be there along with Special Teams analysis as well. We even have a special section for the fans and one section especially for the coaches. More is going to be added with the Player Technique articles over time, and as we add more analysis articles–they go into the library! And … it takes money for web development costs, so if you would like to help create and maintain this for all Oregon fans–do scroll below to learn how. If you are retired, and have decent tech skills and can volunteer 5-10 hours a week? I do have a ton more I wish to add and need help with the massive Oregon Football Repository. Go to the top and click on “Contact” to email me. 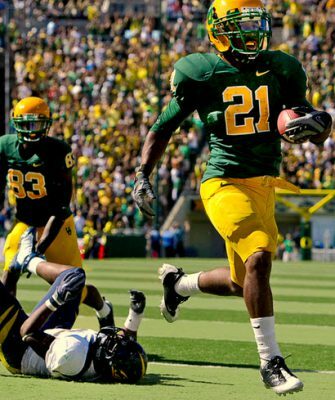 Help us Build and Maintain an Oregon Football Repository at FishDuck.com for all Duck fans! Ed Dickson and LaMichael James. The BEST of FishDuck.com Humor! Click on the live links above and enjoy! Current articles of Analysis, Editorials, Coach’s Opinion, and Talent Evaluation will continue with new articles every week on Mondays and Wednesdays (and sometimes Fridays) at FishDuck.com as before. Mr. FishDuck has already put tens of thousands of dollars into the site (with nothing in return) and needs help to keep these 1,000+ articles (incredible!) available, to add to them over time, and to allow him to continue to write every week. We want to keep all of this on the site free to all Oregon fans, for a very long time. Please donate to make this site a gift to all Oregon fans as a long term source of Oregon Football Information! Kiko Alonso and the Oregon Defense! Please donate to FishDuck.com at the PayPal button below under the account of charles@fishduck.com and you can also donate using your credit card by clicking on the button below. Thank you from all of us at FishDuck.com! Our entire staff thanks you!